First aid kits are essential in every house. They are necessary to treat any wounds or injuries that might occur at home or even outside, when you are traveling. You should always keep a first aid kit in your home as well as your car. Providing the right treatment immediately after an injury helps protect the wound against infections. If the wound is a result of an insect bite or poisoning, first aid can prevent infection from spreading to other parts of the body. A first aid kit contains a variety of items to treat scraps, cuts, burns, sprains and other injuries. It also includes items to deal with common minor ailments. 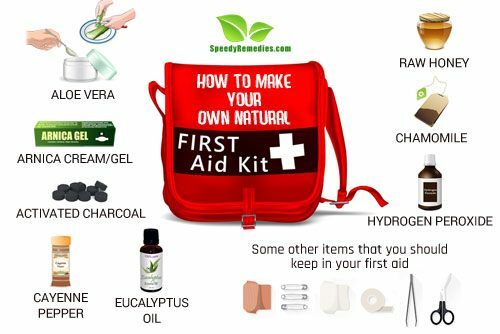 You can buy a first aid kid from health stores or you can make your own natural first aid kit. These natural first aid kits are minimalistic with few multi – purpose natural remedies. It also generates lesser waste when compared to the store bought one. A great herb for the skin, aloe vera can be stored in a gel form for immediate use. It can be used for minor burns, rashes, insect bites, sun burns and inflammations. Aloe vera has anti – inflammatory, anti – oxidant and anti – bacterial properties. These make it a great natural medicine to use in cases of insect bites and rashes. Aloe vera also has soothing properties and can therefore be used to provide a cooling sensation on skin where it has minor burns and sun burns. While you can use an aloe vera leaf directly on your skin, gel form of aloe vera or aloe vera tissue is easier to carry when traveling. You can buy both of them from herbal medicine stores or online stores. Cayenne pepper is good for your food cabinet as well your first aid kit. It aids in digestion, relieves migraines and works as an anti – irritant. But the reason it belongs in your first aid box is due to its clotting ability. Make a paste of cayenne pepper and water and apply it on the wound. The wound will stop bleeding within 3 – 4 minutes. Cayenne capsules should also be kept in handy. These can be used to prevent internal blood loss in case of an accident. Use empty gel capsules to fill it with cayenne pepper and take it with you whenever you go traveling. Arnica is an anti – inflammatory, analgesic and anti – microbial herb that has been used to treat sore throats, inflamed joints, and swelling and bruising from injuries. While arnica can be used orally (not swallowed) to treat gingivitis, sore throat and mouth ulcers, it should only be used externally in its gel form. Arnica balm/gel/cream should be applied externally to relieve pain from injuries, swelling and bruising caused by accidents and for any sprains or trauma. It should not be applied on open wounds or broken skin as it can cause irritation. There are also cases of arnica allergy, so make sure you are not allergic to it. Chamomile is an ancient medicinal herb that can be used in the form of salve, vapor or tea. It is known to have anti-inflammatory, antibacterial, astringent, and deodorant properties. Chamomile tea can be used to relax your upset stomach and as a mild sedative to have a better sleep at night. In tincture form, chamomile soothes irritated skin, inflamed gums and for various skin diseases like edema, psoriasis and diaper rash. It is also used to wash wounds to prevent bacterial activity. You can keep chamomile tea bags at your home or carry them with you in a box when you travel. You can also store the tincture in a vial or small bottle for easier carrying. Hydrogen peroxide is a mild antiseptic used on the skin to prevent infection from small cuts, scraps and minor wounds. It can also be used to rinse your mouth to relieve mouth irritation due to cold sores or gingivitis. It can also be used to treat ear infections. Just put in few drops of 3 percent hydrogen peroxide in each ear for about 15 minutes. Drain out the liquid on a tissue from one ear before repeating it for the other one. If you are applying hydrogen peroxide on your skin, clean the area with water first. Then apply a small amount of the product on the affected area, 1 – 3 times daily. When using as a mouth rinse, mix with an equal amount of water before using. Swish in the mouth over the affected area for at least 1 minute, and then spit out. Do it 4 times daily. You can carry small bottles of hydrogen peroxide to use it anywhere needed. Charcoal is made from coal, wood, or other substances. It becomes “activated charcoal” when high temperatures merge with a gas or activating agent to increase its surface area. Activated charcoal is often used to treat food poisoning, intestinal problems, vomiting or ingestion of toxins. It is sometimes also used to treat hangover. The activated charcoal is mixed with a liquid, preferably water and given either directly through the mouth or via tubes that go through the mouth and into the stomach. Activated charcoal is also available in tablet or capsule forms to treat gas. This form is not used to treat a poisoning. Keeping activated charcoal is handy if you have small children who can ingest a number of things, including toxins. It is also an easy method to treat food poisoning, especially when travelling. But keep in mind that not all poisoning or toxins can be treated with activated charcoal. Always keep the number of the nearest poisoning center with you and rush to the emergency room. Eucalyptus oil is a well known natural remedy for a variety of illnesses and medical issues. And it’s not surprising as eucalyptus oil has anti – inflammatory, anti-bacterial, anti – septic and decongestant properties, making it a must have for your natural first aid kit. Eucalyptus salve or ointment can be applied on wounds to prevent bacterial infection on the area. Diluted form of eucalyptus oil can be taken orally to treat cough, asthma attacks, sinus pain and respiratory infections. Eucalyptus essential oil is affective against mouth cavities and can be used to rinse your mouth. It can also be applied on your joints and muscles to ease pain. Eucalyptus oil is available in easy to carry vials, either online or in herbal medicine stores. You can also use ointments containing eucalyptus or a salve made from it. If you are traveling to a tropical area, to a country that has issues with clean water or if you just have generally weak stomach that does not tolerate experiments with food, you should have a bottle of probiotic supplements at hand. Using a high quality probiotic supplement is an effective remedy to deal with traveler’s diarrhea. If you have constant loose motions, taking in probiotic supplements will subside the problem within a few hours. Read the instructions on the box or consult with a doctor to check what dosage you should be taking. Usually 1/8th of a bottle is taken every hour till the motions stop. Always keep raw honey in your house as it has a lot of health as well as medicinal benefits. If you are traveling, carry a small vial with raw honey in it. Or you can buy a small raw honey bottle if space is not a constraint to you. Raw honey was used in the world war to apply on soldier’s wounds to prevent them from getting infected. It was also used to stick the skin together in an open skin injury. While you do not have to go to such extremes as we have doctors available all the time, it gives you an idea as to how beneficial it is to always have honey with you. You can apply it on minor cuts and bruises, scrapes, and even burns. The vitamins, sugars, minerals and enzymes present in it help disinfect and repair damages skin tissue. Just clean the area with water and soap, preferably with warm water if it is available. Apply a little honey on the absorptive pad and cover it with bandage. Raw honey can also be used to treat cough and sore throat. Thyme as well as thyme oil has amazing benefits for your health and skin. It has antiseptic, anti – fungal and anti – inflammatory properties that make it a must for every natural first aid kit. You can use thyme oil to treat burns, itching, ringworms, eczema, psoriasis and parasitic skin infections. A mixture of thyme and honey can be applied on the wound to prevent infections from developing in that part of the skin. Thyme oil is also an efficient method to keep the insects and mosquitoes away. You can burn thyme leaves in campfire or apply thyme oil to your skin. To make the thyme oil brew, mix 4 drops of thyme oil to every teaspoon of base oil like olive oil. Now apply this mixture on your skin to keep the mosquitoes and insects away from your body. It is a good idea to buy a portable container with sections to keep the different items you would need for your first aid kit. A box that is easy to carry will come in handy when you are traveling.